The United States sent a talented team of orienteers in France for the 2011 World Orienteering Championships. Read on for results, day-by-day commentary from Peter Gagarin, and links to maps and photos. Note: There is also coverage of the World Trail-O Championships. Photo albums from U.S./Canadian spectators Eddie Bergeron, Clem McGrath, Dave Yee, and Adrian Zissos. Women – Samantha Saeger and Alison Crocker qualified for the final! Qualifier, Aix les Baines (tentative): Samanatha Saeger (7th in her heat) and Alison Crocker (6th) qualify for the final; Louise Oram and Will Critchley qualifiy for Canada. Women's: 1st - Annika Billstam (SWE), 1:22:26; 2nd - Dana Brozkova (CZE), 1:26:54; 3rd - Helena Jansson (SWE), 1:29:55; 33rd - Carol Ross (CAN), 1:56:46; Alison Crocker (USA), DSQ. Men's: 1st - Thierry Gueorgiou (FRA), 1:47:29; 2nd - Pasi Ikonen (FIN), 1:51:56; 3rd - Francois Gonon (FRA), 1:53:35. No Canadian or US qualifiers. The U.S. Team finished 14th out of 16 teams in the Team Competition. Women: 1st - Helena Jansson (SWE), 33:10; 2nd - Ida Bobach (DEN), 34:26; 3rd - Judith Wyder (SUI), 35:11; 36th - Louise Oram (CAN), 45:13; 42nd - Alison Crocker (USA), 51:15. Men: 1st - Thierry Gueorgiou (FRA), 34:38; 2nd - Peter Öberg (SWE), 36:59; 3rd - Olav Lundanes (NOR), 37:01. No US or Canadian qualifiers. Women: 1st - Finland, 1:42:42 (Fincke, Rantanen, Kauppi); 2nd - Czech Republic, 1:42:43; 3rd - Sweden, 1:42:44; 12th - Canada, 1:58:29 (C. Ross, E. Kemp, Oram); 25th - USA, 2:40:34 (S. Saeger, Jospe, Crocker). Men: 1st - France, 1:53:48 (Adamski, Gonon, Gueorgiou); 2nd - Norway, 1:57:52; 3rd - Sweden, 1:58:03; 27th - USA, 2:55:43 (R. Smith, Laughlin, Zhyk); Canada DSQ. Some, maybe a lot, already know that the 2011 World Orienteering Champs and World Trail-O’ Champs start tomorrow. But just in case, here’s a bit of a heads up about what’s on tap. The WOC is being held in Chambery, France, a small city in eastern France about an hour’s drive southwest of Geneva. The sprint will be urban, as has become the tradition, whereas the other events will take place in the hills to the east. Maybe I should say mountains, or at least very serious hills, elevation around 4,000-4,500 feet. And from all appearances, it will be rough and tough orienteering. The first event is Saturday afternoon, the Long qualifier, with the usual rules—up to 3 runners for each country, one in each of three heats, and the top 15 in each heat advance to the finals which will be held later next week. It is not easy, not easy at all, to make the finals. Running for the USA will be Alex Jospe, Samantha Saeger, and Alison Crocker for the women, and Wyatt Riley, Jordan Laughlin, and Ross Smith for the men. Good luck to all of them. No one is saying it is going to be easy. Join me in sending lots of good wishes to all our team members. Today was the Long qualifier, and might as well get right to it—bravo to Alison Crocker who finished 10th in her heat and advances to the final on Wednesday. Ali was reasonably pleased with her run (this was before she know she had qualified, when that was clear she was delighted); maybe two or three minutes of mistakes, but never anything real bad or total panic. Good for her! Canadian Carol Ross also qualified (14th in a different heat), and so both countries have one in the finals. I talked to Alex and Samantha afterwards. Both had a real bad control. These things happen. Tomorrow is another day. The guys (Wyatt, Jordan, and Ross) all also had controls that they would just as soon forget about. Just a short report for now.... Today was the Middle qualifier. Once again we had one qualifier, Ali Crocker, again with another brilliant run, finishing 7th in her heat and beating among others, the women from Switzerland, Denmark, Russia, and Norway (with the Norwegian ending up 16th and not qualifying for the final). Ross Smith and Ken Walker both had really good runs, 34 minutes and 35 minutes. Don’t have their places yet, but something about 31-32 minutes was needed to qualify. Very close. And a good bit better run today for Alex Jospe which was nice to see. Cristina was filming interviews with several of today’s runners, and I assume they will be posted on the blog a little later. (1) The Team is in France representing all of us in orienteering, but there are lots and lots of orienteers who aren’t on ClubNet or the Team e-mail lists. Help spread the word about what they are doing via your own club websites and friends. The Team is a great bunch and are working hard to represent us as well as possible, and people need to know that. (2) Give them some support. A very easy way is to go to the Team blog (http://usa-orienteering.blogspot.com/) and leave a comment, or lots of comments. It’s easy to get a bit lonely over here. Getting encouragement from back home is great. I’d love to see lots and lots of comments, and it’s not hard, just need to do them one at a time. And it would be especially great to hear from all the powers that be in the federation. Tomorrow is a rest day, then Tuesday is the Sprint qualification in the morning and Sprint final in the afternoon, plus the first day of the Trail-O. PS. One qualifier also for the Canadians, Louise Oram. Note that the deal over here with our friends to the north is that we root for each other in all the individual events, it’s just in the relay at the end that we become enemies. The World Trail O Champs (WTOC) are about to start, the model is tomorrow and the two competition days are Tuesday and Wednesday. In anticipation of this I have a couple of short items to report. -- Gail and I had just sat down to dinner when someone walked by with a shirt on that included "Trail O" in the design. Had to investigate. It was a member of the Japanese Trail O team; there were ten of them in all, competitors and officials. He seemed in a hurry to get back to his table so we didn’t chat long, but when I asked about how they hoped to do, he answered, "We hope to win." At least they’ve got the right attitude. -- I spent a while today talking to Karl Ahlswede of DVOA, who is on the USA Trail O Team here. And we talked about his preparation and it was cool to hear the things he has been doing: Reading the rules over and over to make sure he understands all the nuances (of which there are many), looking up all the courses he can find on the internet, working on his concentration skills (an event can take a couple of hours and you can’t lose focus). I asked rather facetiously at some point if he would have any Gu with him, Gu being a quick shot of energy used by endurance athletes, and the answer was Yes, he needed to make sure he kept his blood sugar up for the whole time. And right now, with the event just about here, well, he was tapering, I kid you not, it was past time to stress about the intricacies of Trail-O, just time to relax and get in a positive frame of mind. All because he, too, wants to do absolutely as well as he possibly can. And he too sure has the right attitude. Then we talked some more about why there aren’t more trail O’s in the USA. It seems to be so complicated that we can only organize a couple a year. But couldn’t there be a local meet version of trail O? Maybe not held to such a high technical standard, simpler to organize, give more people a chance to try it, and do it more if they like it, and maybe find some more people who are really good at it. Something to think about. A rest day today for the WOC team. Those running the sprint tomorrow were partly in Aix, walking around and checking things out to the extent allowed by the rules, and partly in Chambéry at the Sprint model. Alex, Sergei, and Wyatt were up on the mountain training in the junk we are learning to love. Just as with the Long and the Middle, there are three heats, with a runner from each country in each heat, and the first 15 in each heat advance to the final, which will be tomorrow afternoon in Chambéry. Both the qualification and the final are "city" sprints. Should be exciting. The Trail O champs (WTOC) start tomorrow, first of two days. There are two classes, Paralympic and Open. Our team members in the Paralympic class are Cathy Yekenevicz and Glen Cafferty, and in the Open class Sharon Crawford, Richard Y. Ebright, and Karl Ahlswede. PS. More stuff keeps getting added to the Team blog. Don’t forget to add comments, they love hearing from home. PS. And a close call for Ross, about a minute too slow to qualify, he got caught in a couple of dead-ends and that was enough to do it. But he is getting better and better too. So the Sprint final is over and Ali and Sam have done really well, 27th in the world for Ali and 38th in the world for Sam. I’m pretty sure that 27th is the best we’ve ever done at WOC. The sprint was in the middle of the small city of Chambéry, a maze of streets and small twisty alleys, plus a nice castle, with the start and finish right in front of the castle and all the streets blocked off to traffic. Just an amazing scene. Lots and lots of people, enthusiastic cheering and flag waving, a huge video screen, great announcing. Orienteering with the feel of a big-time sport, in other words. The eventual winners were a Swedish woman (with Swedes also second and third) and a Swiss man. And we all went away feeling quite worn out from all our hard cheering. :-) And also feeling very proud of our Team, as I’m sure you all are too. And one more thing, because after talking to Ali and Sam after the race, one thing became clear. Neither one had run a good race. No big mistakes for Sam, but the flow wasn't there and her legs were getting real tired the last half. And Ali had one terrible control, misread the clue for the control at the castle, lost 55 seconds to Sam right there. It's a sign of how good these two are getting when they can place as well as they did when not at their best. The future looks very bright. Cristina Luis has been doing a fabulous job of getting news, photos and video posted on the Team blog. More video interviews from this morning after the Sprint qualifier are already up, interviews from after the final are coming. Check it out, enjoy it, leave some comments. Wednesday is the Long final, Ali running for us, Carol Ross for Canada. It’s an afternoon race over here, Ali starts at 13:16, so good breakfast viewing for you back home on the east coast (7:16 AM), and either real early or real late on the west coast. Join us in cheering for her, if just from a little farther away. Today was the Long final, the traditional individual race, and it certainly kept with tradition in that it was long and it was hard. The fact that it was a beautiful day for spectating, but way too hot for the runners, just added to the challenge. There were still some brilliant performances, most notably that of Frenchman Thierry Guergiou, winning in his home country to the delight of the largely French crowd. And actually I think to the delight of most everyone, as winning the Long for the first time on his home soil, well, it just seemed like the right place and the right time. The women’s winner was Annika Billstam of Sweden. For our qualifier for the final, Ali Crocker, it was not her best day, and she ended up being disqualified for not punching at one of the water stops. She was close to not starting; her hamstring was acting up after the two hard sprints yesterday, but she got a massage from Sandra [Lauenstein, formerly Zurcher and on last year's U.S. Team] and then just kept jogging until her start so it wouldn't tighten up. First part of the course was OK, just a little miss at #2, but she knew right from the outset that she had dead legs. She hung in there pretty well, took the righthand (lower) route on the long leg, thought afterwards left/straight was better. Trouble at 8, lots of bushes, just didn't see it, cost her about 6 minutes, missed it a little the second time too. Then 17, second time there, you always punch first but this time the way she was coming in to the control the water was first. She took a drink, planning her route to 18, and then just headed off, never punched. Then problems with 18, another 4 minutes, came in from the southwest, missed it, out to the road to the north then back in. Time was 1:59:00+. A tough day, but some days are like that in orienteering, and hopefully you learn from each one. And she is one tough competitor. So it wasn't a good run physically or mentally. These things happen. Her morale is actually not so bad. And tomorrow is a rest day. I am remiss in not mentioning up to now the contributions to the Team effort by our Team officials on site — Team leader Beatrice Zurcher and her assistant (and daughter) Sandra Lauenstein. The karma on the team has been as good as I have ever seen it, and Beatrice and Sandra should get a lot of credit for making things run smoothly. It’s not an easy job. "Day 1 WTOC, I had a huge mistake in that I thought I had 120 minutes when I only had 111. The bulletin info had said 120 but we were told the night before that we had 111. I am not sure why I ignored that info. So that gave me a 2 point penalty in addition to the 6 I missed all on my own. So while I am not last I am pretty close. "I have a great deal of respect for the top competitors though. First through ninth were perfect and I think that missing one goes down to 20th place or so. Richard only missed 2 but was just a little overtime so he finished with 19 so great job there. Plus he nailed the timed controls which were tough. Sharon finished with 16. Congratulations to her. "Day 2 of WTOC 2011. Well I redeemed myself for yesterday's fiasco with a 20 out of 22. By my hand count I was 14th for today (so I met my goal of a top 15 finish) but 42nd for the overall competition (which was well below where I wanted to place). Today there were only 2 perfect scores and my very brief claim to fame is coming in ahead of 3 of the 4 Swedes for today’s event." Congratulations to Karl at his first WTOC! Women: Sam, Ali, Alex in that order but could still be subject to change. Men: Ross, Jordan, Sergei in that order. Today was the Middle final, won by Helena Jansson (giving all three individual golds to Sweden) and Thierry Gueorgiou of France, his second gold. Ali Crocker finished 42nd for the USA. I haven’t seen her since she ran, so I can’t give any inside scoop. Her splits show 2 bad controls, the first and then the last one of any difficulty just at the end. In between she ran a lot of good legs. So it’s one of those days that you chalk up to getting experience, so that next time you make out better. Tomorrow afternoon is the last event, the relay. -- For the most part, it seems like the French have done a terrific job. I’ve been impressed by the organization (mostly), by the maps, the terrain, the courses, the PR (big spreads in the local papers), the friendliness of the organizers. The main flaws that I have seen have been two. (1) The Sprint qualifier was close to a disaster. First, the computer system , which was being run by a Swiss outfit!, wasn’t functioning right. The announcer could give times, but that’s all. He was heard saying, "I'd give you positions but nothing works." This seemed a bit embarrassing, but not a fatal flaw. (2) Close to a fatal flaw was the fact there there were a lot of disqualifications in the sprint qualifier, and there could have been a lot more. First, there was a wall, part of which was mapped as passable, and part as impassable, and runners were crossing it in the impassable section. But it was hard to tell just where the change was. In the end, none of these were disqualified. Second, teams had been told that all lawns at the end were out of bounds, and they were mapped as such, but lots of runners were seen cutting across them. So they were DQ’d. And then there were protests. And a very heated team leaders meeting. And a desire to delay the start of the afternoon final to sort things out. Except Finnish TV would not go for that, they were showing it live. And so they ended up running on time, but allowing three extra runners in the final in case they were reinstated, which they were. So it sort of worked out OK. But it was very close to a total disaster. But, as I said, in many, many areas the French seem to have done a wonderful job. -- With the USA toying with the idea of pursuing a bit for hosting a WOC in a few years, many who were involved in WOC93 have given there opinion about the wisdom of launching on this new venture. I would just like to point out a couple of things: (1) WOC93 had 4 WOC races and 5 spectator races, or 9 races in all, over a 9 day period. It seemed hectic. 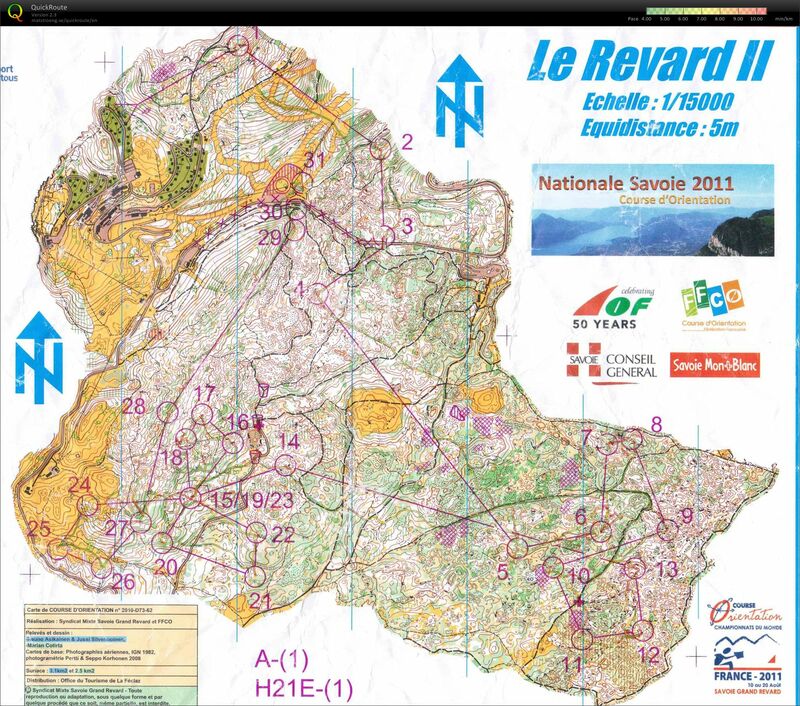 WOC 2011 has 7 WOC races and 6 spectator races, or 13 in all, in an 8 day period. They seem to be handling it well. And their spectator races have about 3,000 participants. Somebody, or more accurately a lot of people, are doing a whole lot of work. (2) I don’t know the chief organizers for the French. I do know that the chief organizer for WOC93 was a highly motivated and hard-charging individual, Per Stensby, without whose leadership WOC93 would never have happened. I assume there are similar people involved in WOC 2011. I have not seen anyone in OUSA now with anything near Per’s drive and organizational skills. And the WOC is a lot bigger operation than it was back then. I’m not saying the Danish proposal should automatically be rejected. But before we go down that road there should a sizeable group of skilled and motivated and highly organized people willing to commit a few years to the project. Right now, I don’t see anything close to such a group. The relay was the final event of WOC 2011. A great pleasure to see the French men win, with what seemed to be a perfect final leg by their star Thierry Gueorgiou (TG). It is very cool and very admirable to see someone perform so well under the most pressure possible — for three straight years the French men have been in position to win the relay, and each time something has happened on the last leg (stopping to aid an injured runner, a bee sting to TG, and a control inadvertently skipped). And this time in France, at home. And you watch his route on the big screen and it is just perfect. And it looks so easy. And you have already watched the best women in the world make it look incredibly difficult, with mistake after mistake after mistake. And it is incredibly difficult. So how does TG do it? He trains and he trains and he trains. He has said every day he thinks, "What can I do today that will make me better for the WOC?" He even trains in similar terrain at night, just to make it harder. And so after the middle was over, he said it was thinking it would be more difficult. Because he was so well prepared. There is a lesson there. Our teams did OK. Not what you hope for, and that is so often the case at these events, but there were still moments of brilliance. In the relay, Sam ran another of her excellent opening legs. She is quite the expert at them, and this despite having major doubts earlier in the week that she could ever master this terrain. Ross also ran well. A slight mistake at the first control, no more than 30 seconds or a minute, meant he was struggling to stay in contact with other faster teams that he was hoping to be with. So it wasn’t a brilliant run, but it was a good solid run, and that is to be admired. And Sergei, running last leg, started out just behind the Canadian team, he too had a good solid run, and when he arrived at the last control well in front of the Canadian and then ran happily down the finish chute, you couldn’t miss the wide smile. A very nice final image to have from the week. So there were certainly some successes. And of course also some frustrations, for sure. Ali said afterwards that what she really wanted to do was stay in Chambéry another week just to figure out how to master this terrain, but that wasn’t possible, real life was calling. It is frustrating that it is so difficult and expensive to get to these places, to spend the time needed to really get good. It is frustrating that there is no support from the federation (its priorities are elsewhere). But it is still a great joy to watch a group of very fine young men and women do their best to represent us as well as they can. I know all have plans to be better by this time next year. Anything you can do to help them, and to help other young orienteers get better at this fascinating and demanding sport, will be much appreciated. Because when they do well, it is just so much fun to watch. WOC 2011 Goals: I'd like to place in the top 30 in the sprint and long finals. Fun Fact: I'm moving to Uppsala, Sweden for a year to live and breath orienteering! WOC 2011 Goals: Make finals, if I can race well, maybe top 30, would be awesome! Fun fact: I'm on a mission to eat the top 100 cheeses in the world, hoping that this years WOC in France will allow for trying a few more! Fun Fact: I really don't like cheese (except on pizza)....going to France may be a bad idea. Fun Fact: I love my pillow and it travels with me everywhere. It's much thinner than most pillows but it's perfect for me. International experience: A pair of Wawel Cups in Poland as a junior. WOC 2011 Goals: Qualify for the A-final in the middle. Beat a strong Canadian team in the relay. Fun Fact: I once tried to run away from Marc Lauenstein... still wondering what in the world I was thinking. WOC 2011 Goals: Make A Final in Sprint and Long, Help relay team achieve 25 or higher finish. Fun Fact: I love making and eating desserts. WOC 2011 Goals: I will be aiming to run fast, mistake-free races. Many thanks are due to the small but highly skilled group of organizers of the Trials: event director Guy Olsen, course designer Neil Dobbs (from Ireland!) with vetting assistance from Becky Carlyle (from the UK! ), course consultant Eric Weyman, and e-punch guru Sandy Fillebrown. Maps provided and/or updated by Orienteering Unlimited/Bob Burg (SUNY Purchase) and HVO/Paul Bennett (Blue Mountain). The event was sponsored by Hudson Valley Orienteering. Vladimir Gusiatnikov, Kris Beecroft, and Rick Worner served on the team selection review panel.